Here’s a quick (and cheap!) craft I did in an attempt to solve the ‘backpacks & lunch sacks all over the floor’ issue. Now my boys know exactly where their coats and backpacks go after school. I hung these above our shoe organizer seat in the foyer, so it’s the first thing they see when they walk in the door. 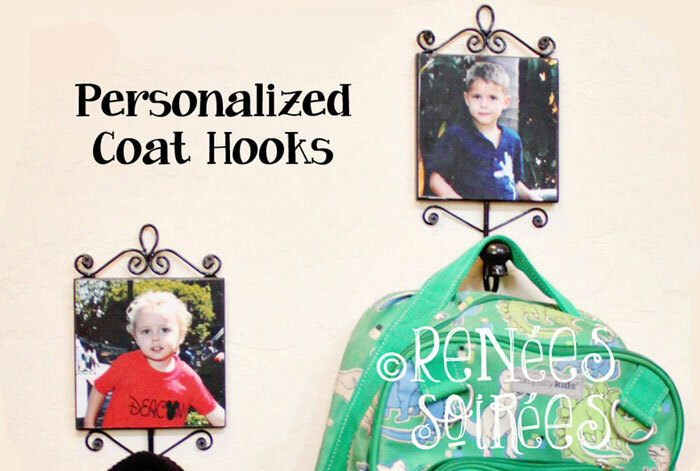 I found the hooks on clearance at Hobby Lobby for less than $2 each, but I wasn’t crazy about the design. 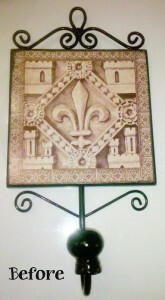 Let’s be clear… I LOVE Fleur-de-Lys. Because of my French name, I’ve been decorating my home with them since 1992. Back then I had to import them from France because the only fleur-de-lis I could find in the US had Boy Scout stuff on it. Fortunately I studied in France briefly, so I brought a bunch of the decor home myself. AND taupe is probably my favorite color. But this design just didn’t resonate with me. So it had to go. Because the design was 5″ square, I printed a photo of each child in a 5″x7″ size (38c each at Sam’s Club – best price out there)! Then I trimmed the photos with a paper cutter, and applied Mod Podge onto the face of the existing design and placed the photo on top. The next day I coated the top of the photo with Mod Podge, and let it dry. Then it was just a matter of hanging them, and explaining to the boys the consequences for putting their coats and rucksacks on the floor instead of on the hooks (which ranged from extra chores, to grounding, to locust swarms and other pestlience in their bedrooms). 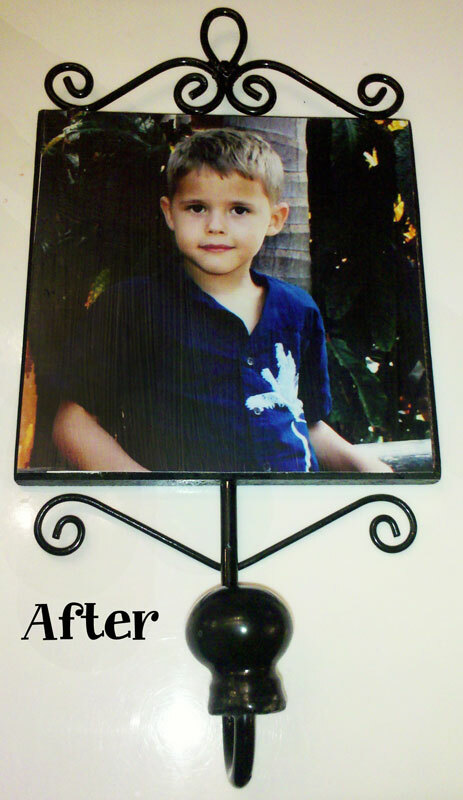 The entire project cost me less than $5 (though I already had the Mod Podge, because really, who could live without it)? !